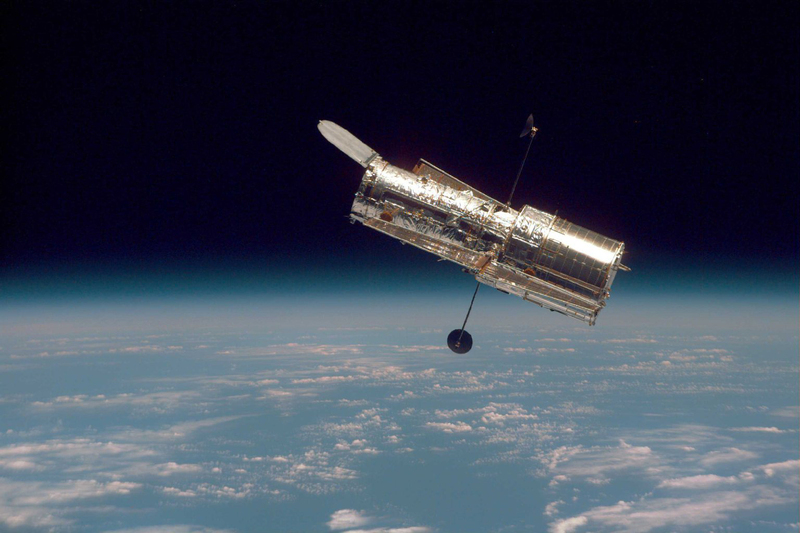 The Hubble Space Telescope is a robotic telescope located on the outer edge of the atmosphere, in circular orbit around the Earth at 593 km above sea level, with an orbital period between 96 and 97 minutes at a speed [of] 28,000 km/h. Named as a tribute to Edwin Hubble, [it] was launched into orbit on 24 April 1990 as a joint project of NASA and ESA, thus inaugurating the Great Observatories program. [The] cylindrically shaped Hubble weighs 11 tons. Its length is 13.2 m and its maximum diameter is 4.2 meters. The telescope can obtain images with optical resolution [finer than] 0.1 seconds of arc. The following image clearly shows how low the orbit is. In fact, the Earth is "in the way" about half the time. The Hubble does not weigh 11 tons right now. It is weightless. You only experience "weight" when you are being affected by gravity. While the Earth's gravity still acts on the Hubble, like all orbiting bodies it experiences "free fall", so is weightless. More accurately, Hubble's mass is 11 tonnes. It would weigh about 108,000 N on the Earth. "The telescope can obtain images with optical resolution [greater than] 0.1 seconds of arc." This is actually quite interesting. What does "0.1 seconds of arc" mean? Angles are commonly measured in degrees. We know that a right angle is 90° and that a steep slope for a road is 15°. One complete revolution is 360°. Here is a small angle (the smallest I can show without it looking like a single line), 2°, also called "2° of arc". The Hubble Space Telescope needs to "see" very small parts of the sky. When we want smaller units than one degree, we take divisions of 1/60 of a degree, called minutes (just like 1/60th of an hour is one minute. Such divisions come from the ancient Babylonians). If minutes are not small enough, we take 1/60th of a minute, to give us seconds (just like in units of time). So "one second of arc" means 1/3600th of one degree. But Hubble can do even better than that - it can discern a field of view which is 1/10 of 1/3600th, or 1/36,000th of one degree. Not bad! In science and engineering, the radian is a more convenient unit for measuring angles than the degree. One radian is the angle shown in this diagram. If we rotate around a circle such that we travel the distance of one radius, we will have traced out an angle of one radian at the center. It's about 57.3°. So in radians, the Hubble can distinguish around 4.8 × 10-7 of arc. To finish, here's one of my favorite pictures by Hubble. It's a star that erupted in Jan 2002, and it was 600,000 times more luminous than our Sun. Of course, the star erupted 20,000 years ago and it took that long for the light to reach us. If you're going to be a pedant about the weight/mass thing, at least don't introduce even larger errors by yourself. > More accurately, Hubble’s mass is 11 tonnes. It would weigh about 108 N on the Earth. 108,000N is the figure you're looking for. Oops - thanks, Anthony! I have updated the post. I don't think Zac's a "pedant" for pointing out something which is basic physics. There is a difference between mass and weight. I am a fan of the HST. I have many, many images taken by Hubble. I have always been curious about one thing though. Why are Hubble's images not rectangular, sort of in the shape of the B2 Stealth Bomber? Actually the HST does have weight. It's weight is its mass times the gravity it experiences (around 8.2 m s^-2). Yes it is 'weightless' but this is a term to describe the experience of being in free fall, it does not mean having no weight.